clusterProfiler is a nice R library for doing GO and KEGG enrichment analysis. It has a simple interface and it can produce some clear plots using the ggplot engine. Today I contributed a formula interface to clusterProfiler, making it easier to do enrichment of multiple groups of genes. 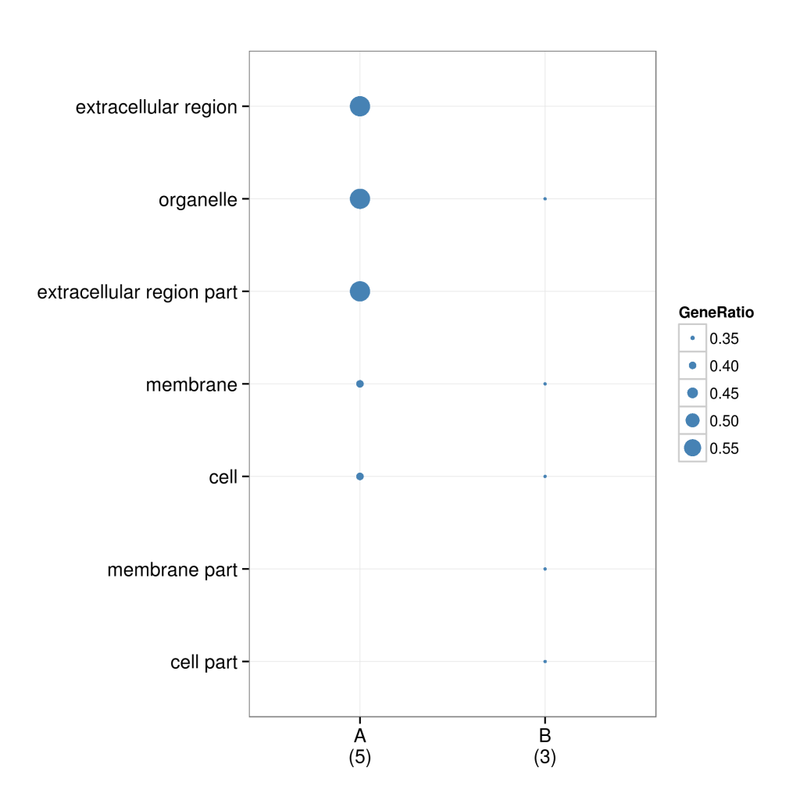 In this case group A is enriched in membrane and extracellular region, while group B is only enriched in membrane genes. The groupGO function used here doesn’t provide p-values – we should have used enrichGO instead. I guess that the 3 Entrez ids in group A correspond to 5 genes in Gene Ontology, so that’s why the plots shows a total of 5 in group A. See clusterProfiler’s documentation for better examples. Of course this example is not much interesting, since it is only 6 randomly chosen genes. However with bigger datasets the formula interface can be much more powerful. However this would probably require introduce some retro-incompatibility in the library, and it is not a big deal as the Cluster column can be easily split using the separate function from tidyr. That’s really nice. Thank you for your contribution! plot(GO.enrichment, plotAll=T) should be plot(GO.enrichment, includeAll=T). By default, includeAll = TRUE.